Transparency Market Research (TMR) notes that the global protein ingredients market is categorized by the presence of several large and small players operating in it. The rivalry between the players is likely to increase as they aim at offering healthy foods and producing protein ingredients with increased nutritional value. Among the multiple strategies adopted by players in the global protein ingredients market to stay ahead of competition, product innovation has paid off the most. The global protein ingredients market is expected to grow steadily due to the existence of large players who are investing in innovative branding ideas. Some of the leading players in the global protein ingredients market are Cargill Plc, Kerry Group, DMV international B.V, Sterling Biotech, and Glanbia Plc. 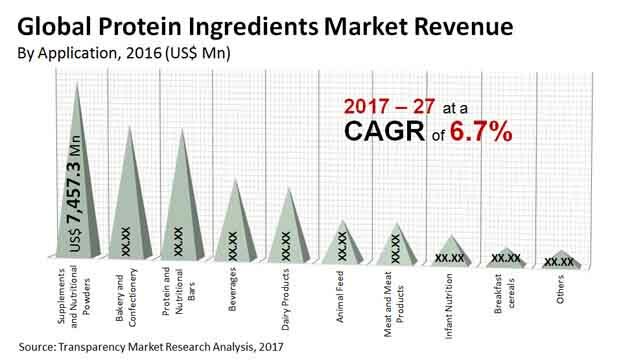 The TMR report projects the global protein ingredients market to register a promising CAGR of 6.50% from 2017 to 2027. By the end of 2027, the market will be worth US$64.35bn, predicts the report. Out of the various types of protein ingredients, the demand for animal proteins is expected to remain high in the next few years as they are rich in nutrition and consumption of animal proteins in daily basis increases fitness. Regionwise, North America is expected to lead the global protein ingredients market in the coming years. This is attributed to flourishingfood and beverages industry in the region. Growing demand for animal proteins, increasing awareness about fitness, and rising incidence of health issues due to the lack of protein supplements are factors driving the global protein ingredients market. Protein ingredients or protein supplements in food are extensively used in tissue and muscle building. In addition, they also help in improving health. The enormous demand for “purer” products with reduced processing, rising demand for convenience foods with sufficient nutrients, and increasing preference for fortified foods are fueling demand in the global protein ingredients market. Protein ingredients can be sourced from animals or plants. Plant protein ingredients are mostly derived from soy, pea and wheat. They are widely used in texturizing vegetable proteins. Proteins are mainly available in the form of isolates and concentrates. Growing usage of soy isolates and concentrates has been driving the need for plant proteins, thus bolstering the demand in the global protein ingredients market. Animal protein ingredients can be derived from caseinates, eggs, and animals. They are considered as a protein-rich foods. Increasing rate of consumption of eggs and dairy products, growing demand for protein-rich foods from athletes or sportspersons, and rising health consciousness are expected to boost the global protein ingredients market. Rising preference of junk food over the nutritious variety, is one the main challenges the global protein ingredients market needs to overcome. Apart from this, a cost-sensitive market and fluctuation in the production of protein-rich products are also negatively impacting the market. Nevertheless, launch of less costly protein supplement products will help underpin growth momentum in the next couple of years.